Firefighters are responding to a vegetation fire that started about 30 minutes ago near Rancho Oso off Paradise Road in the Los Padres Forest. Scanner chatter and Facebook posts made by area residents indicate multiple engines are en route, including at least two from the Santa Barbara City Fire Department. A member of the San Marcos Pass Volunteer Fire Department posted on Facebook that the fire, as of 3:20 p.m., was four to five acres and spreading slowly. City and county fire officials haven’t been available for comment. The U.S. Forest Service is also reportedly assisting. [UPDATE, 4:42 p.m.]: It appears firefighters, including hot shot crews and air units, have made headway in containing the blaze. 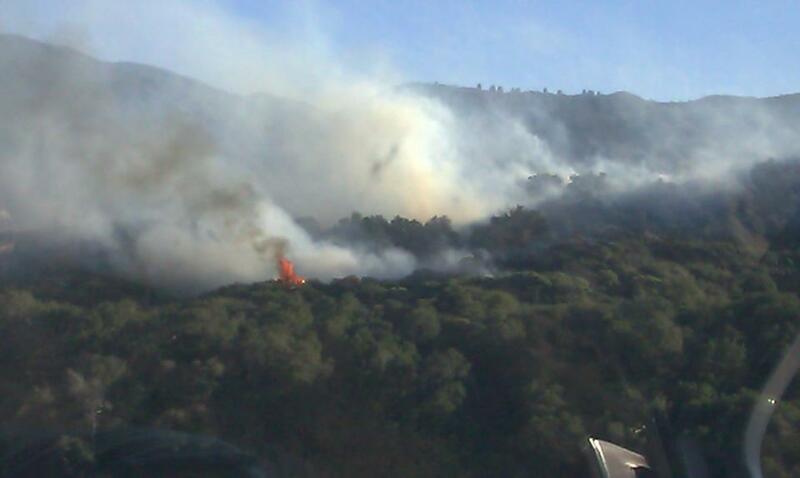 It was pinpointed more specifically to an area near White Oaks Campground off Arroyo Burro Road. [UPDATE, 8:30 p.m.]: Crews are in the final stages of mopping up what has been dubbed the Yellow Jacket fire. Hand crews will remain on-site throughout the night. It’s not known at this point how many acres the fire grew to or what caused it.